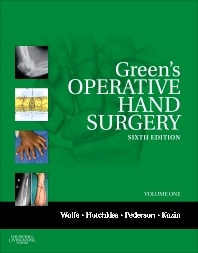 Green’s Operative Hand Surgery, edited in its Sixth Edition by Scott W. Wolfe, MD, provides today’s most complete, authoritative guidance on the effective surgical and non-surgical management of all conditions of the hand, wrist, and elbow. Now featuring a new full-color format, photographs, and illustrations, plus operative videos and case studies online at Expert Consult, this new edition shows you more vividly than ever before how to perform all of the latest techniques and achieve optimal outcomes. Access the complete contents online, fully searchable, at expertconsult.com.